Dear Candy Crusher, thank you for being brave and writing this email. The first step in conquering any addiction is to admit that you have a problem. You seem to me to be fully aware that this silly little facebook game is taking control of your life. 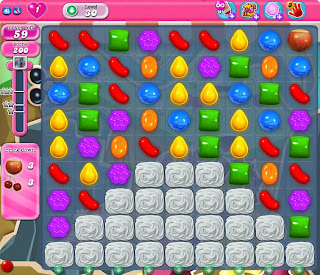 For the 13 people out there who are blissfully unaware of the phenomenon that is Candy Crush Saga, it is a facebook/phone game where an assortment of colored candies appear on a grid. The player swaps adjacent candies in order to make a straight line of 3, 4 or 5 candies to make them disappear from the grid. This action makes the candies above slide down to fill the vacated spaces. Each subsequent grid increases in difficulty as does the frustration level of failing to complete a level. This is where the addictive factor comes in, since nobody wants to be beaten by a silly little game. The programmers try to make it easier for you by offering boosters which are basically cheats to help you progress through the game, but these boosters are limited in quantity. Just like drug dealers, they let you have the first one for free, but you can buy more. If you really want to beat the game, you have to think off the grid. The only way to beat Candy Crush Saga is to stop playing it. The game will continue without end for as long as you are compelled to play it. You will never beat it if you play by their rules. There is no alternative but to go cold turkey, and delete and block the app. Here is a video which may help you come to terms with the psychology of facebook/phone games and what they may be doing to you. I hope this helps you come to terms with your addiction, Candy Crusher, and all those other people who may not yet realize that they have a problem. If you are a Candy Crush Saga addict, leave a comment below to let me know what level you are on and add me to your facebook friends so you can send me some lives.